If you’re looking for a classic, straightforward online casino that offers some of the best live tables as well as slots – there’s only one place you need to check out: Portomasolive.com. If you’re an avid gambler, and ever been to the beautiful island of Malta, the name Portomaso will probably ring a bell. Portomaso is one of Malta’s most popular land-based casinos. Since the casino is based on Malta, it comes as no surprise that they are licensed and regulated by the Malta Gaming Authority. Not from Malta? No problem! Players from all over the world are welcome to sign up and play the available games. The site is even available in three different languages: English, German and Swedish. Talking about signing up, the registration process is very simple and you’ll be good to go withing a matter of minutes. You might be asking yourself what you can expect once you’ve signed up. Will you receive a welcome bonus? What are the depositing options and most importantly: which games can you play at Portomasolive.com? We’ve reviewed this casino thoroughly and will answer all these, and more, questions below. Portomasolive.com understands that some players have different preferences than others. This is clearly reflected in their welcome bonus offer, as it has something for both live casino and slot lovers. Just like with most online casinos, you will have to make a deposit to activate the welcome offer. Once the transaction is complete, you will receive 100% bonus which you can use to play at all your favourite live tables. The maximum bonus amount you can receive is €100. For example, if you deposit €50, you will receive another €50 bonus! Do you prefer to play videoslots? Then you will probably like the second part of the welcome offer more. After your first deposit, you will also receive 50 free spins on Starburst. This is a very popular NetEnt slot that includes expanding Wild symbols and a re-spin feature. Compared to some other major casinos this might not seem like the most exciting welcome offer, but Portomalive.com offers something else that proves they care about customers all the time – not just right after signing up. Every 15th of the month players will receive 10% cashback on the losses they made the previous month. This is calculated based on losses from both live tables and slots. Even if luck is not on your side, they will have your back and provide you with a bonus every month. The cashback has a limit of up to €500, and will be added as bonus money to play with. 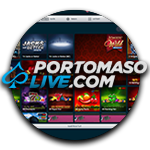 Whether you’re looking for an old school slot, exciting video-slot or a live roulette table – Portomasolive.com has it all. When entering the casino, you will quickly find out that the site is very easy to navigate. The top of the site shows a menu with different types of games: live tables, slots, tables (virtual), lottery, video poker and jackpot games. Simply click on one of these options to view all games in this category. You can also use the search bar to quickly find a game you love, or set filters to narrow down the search results. An example of available filters are recently played games, favourites and providers. You can add any game to your favourite list by clicking on the star. The casino offers games from a couple of top-notch game providers: EGT, Yggdrasil, NetEnt, Betgames.tv and of course their own Portomasogaming.com. The live table selection offers high quality table games which are either streamed live from the land-based Portomaso Casino and Oracle Casino, as well as via live studios. The available table games are roulette, blackjack and punto banco. Something slightly different the casino offers are the so called “mini games”, which allow you to play several games at the same time. As with any serious online casino, Portomasolive.com is ofcourse fully optimized for mobile users, meaning that you can play your favourite games anywhere, anytime. Just like the game selection, Portomaso Live offers a wide variety of payment options. Players can chose between Credit Card, Skrill, Neteller, Webmoney, Paysafecard, and good old Bank Transfer. The minimum deposit amount is €10, and the maximum deposit amount depends on if it’s the first deposit or not. The maximum deposit amount for first time depositors is €200. After you have verified your account the maximum limit will change to €1000 per transaction. Although newcomers might find an authentication process a bit daunting, we personally think it speaks volumes about how serious a casino is when it comes to protecting players. The verification process confirms you are exactly who you say you are, and actually prevents people from using information that is not theirs. Now on to the best part: withdrawals! The minimum withdrawal amount is lower than most casinos we’ve reviewed, and starts at €10. The only exception is when you request a withdrawal via Bank Transfer, where a minimum amount of €30 applies. This is also the only payment method where you will be charged a fee of €5. All other withdrawals are completely free. Keep in mind that your first withdrawal has to be requested via the same payment method that you used to make a deposit. If you for example deposited via your VISA card, you will have to request the withdrawal to the same card. The maximum withdrawal limit is €5000 per day. Withdrawals are processed from Monday till Friday. If your account has been verified withdrawals are usually processed on the same day which means you don’t have to wait long to enjoy your winnings! Portomasolive.com has very friendly, but most importantly very efficient customer service. It all begins with the FAQ’s, where you can find most important questions and elaborate answers. Most players will find the information they need in that section. If you have a question that you can’t find in the FAQ’s, or if you’re experiencing some issues, you get in touch with the support team. At the bottom of the casino you will be able to click on support page, after which you will be able to fill in their contact form. Perhaps even easier is the live chat option. To start a live chat, click on the “Chat” button in the right lower corner of the site. Enter your message and start chatting to be connected to one of the customer support employees. When we tested the chat functionality, we were connected almost instantly. One of the things we dislike when it comes to live chats at some online casinos, is that you sometimes have to wait a long time before questions are answered. Fortunately, this was not the case at Portomasolive.com. Our questions were answered straight away and the employee was very polite. Portomaso live might not have the craziest welcome offer, but they make up for this with an ongoing cashback deal, great customer service and some of the best live games out there. The great game variety in combination with a simple lay-out with plenty of options and filters, make this the perfect online casino for both new and experienced gamblers.